A onetime budding prospect in the Milwaukee Braves’ organization, Al Spangler drew favorable comparisons to Hall of Famer Richie Ashburn for his speed and pesky hitting throughout much of his early career. Seemingly in spite of the table-setting success of an Ashburn-like talent, Spangler often found himself on teams in search of a power-hitting slugger, relegated to a reserve role through much of his 13-year major-league career. Surely so much more was in store for this accomplished left-handed-hitting athlete. Albert Donald Spangler was born July 8, 1933, to Alpheus C. “Al” Spangler and his wife, Doris (nee Jamison), in Philadelphia. Spangler’s father was an accomplished amateur athlete in both baseball and football, and the youngster was lavished with attention from both his parents and his widowed paternal grandfather that, with the inherited athletic genes, helped develop his superb baseball prowess. When Spangler was showing off this prowess at Olney High in Northeast Philadelphia, his prototype -- Ashburn -- was patrolling center field in Connie Mack Stadium less than five miles away, while one of the other Phillies’ outfield slots belonged to Del Ennis, an Olney High alum eight years ahead of Al; through 2012, the school has produced nine professional baseball players, only one of whom did not make it to the big leagues. With the success his high school had established in generating professional talent, Spangler seemingly carried the burden of maintaining the prep school’s reputation, which he did swimmingly in Durham, North Carolina, while attending Duke University. Spangler was originally slated for Lafayette College in Easton, Pennsylvania, with a full scholarship after turning down an offer from the Chicago White Sox. He was instead lured south by Duke’s coach -- and former A’s hurler -- Jack Coombs after Coombs got a glimpse of Spangler’s talent while conducting a baseball clinic in Philadelphia with his former batterymate, Ira Thomas. The Duke Blue Devils have established their own track record of professional ballplayers through the years, and Spangler contributed mightily to this reputation. An All-American college selection after his junior year -- in large part due to a .406 batting average -- Al drew much attention from the major league scouts. In June 1954, through the efforts of Milwaukee scout Gil English (a former major league infielder in the 1930s who four years later also inked pitcher Tony Cloninger), the Braves succeeded in signing the fleet-footed prospect. A contract clause stipulated that Spangler be assigned to the parent club for two years, and thus Al joined the Braves in Brooklyn on June 15. Milwaukee was then in the second of nine consecutive first-division campaigns that included two World Series appearances, and the team was rich with talent. Left field had just been locked down that spring by another 20-year-old rookie, Hank Aaron, while the remaining outfield slots were ably manned by Bill Bruton and Andy Pafko; there would be little playing time afforded for the rookie from Duke. Spangler thus requested an exemption from the just-inked contract by asking for assignment to the minor leagues. The Braves promptly assigned him to their affiliate in Jacksonville, Florida, where Spangler encountered an identical situation. The Jacksonville Braves were likewise manned with a squad that eventually captured first place in the Class-A South Atlantic League, and Spangler saw limited playing time before being reassigned. This time he was headed to Evansville, Indiana, where the Braves’ Class-B affiliate was also destined for a first-place finish, but Spangler secured some playing time here. A .290 batting average in 162 at-bats -- including a four-hit display in early September that lacked only a home run (a harbinger of things to come) from hitting for the cycle -- contributed nicely to the team’s overall success, and spoke volumes of the youngster’s great potential. An attempt to make an early, positive impression the next spring actually backfired on Spangler. Al joined 13 other players in reporting to the spring training facilities in Bradenton, Florida, in February that resulted in a fine levied by major league baseball to each participant. Two months earlier the major leagues adopted a new rule stating that players could not assemble for conditioning before March 1. It was uncertain whether the players knew of this new rule, but they were soon short in the pocketbook -- so much for attempted early impressions! Spangler was reassigned to the Jacksonville club for the 1955 campaign. In a pitching-dominated league, a .287 batting average proved an asset when compared to the league average of .255, and resulted in his selection to the Sally League all-star team. Excluding home runs -- Al hit only five -- Spangler was among the team leaders in most offensive categories. Ominously, Al’s new teammate, Wes Covington, was among the league leaders in round-trippers with 16, and when Spangler was later competing with Covington for playing time with the parent club, this difference in power would have an adverse effect on Spangler’s own chances. History is left to wonder the what-could-have-beens surrounding the events that transpired in the spring of 1956. The Braves had moved Aaron to right field, and the resulting vacancy in left appeared to be Spangler’s for the taking. At 35, Pafko had already seen limited play the preceding season, while the presumed replacement, trade-acquired Bobby Thomson, remained a question mark from a shattered ankle sustained in 1954. This left a group of four youngsters anxiously competing for the open slot, and Spangler appeared to be pacing the field. On the merits of a superb spring Al was dubbed the Braves’ “Surprise of the Training Season,” and assignment to the parent club appeared assured. On March 28, instead of packing his bags for Milwaukee and the start of the 1956 campaign, Spangler was reporting for military induction in his hometown Philadelphia. Uncle Sam had beckoned for a stint in the Army When Spangler returned from his military commitment two years later, he would be faced with trying to break into an established lineup of reigning world champions. Meanwhile, Spangler was joining his own squad of champions. Assigned to Fort McPherson, just outside of Atlanta, Spangler’s near-.500 batting average contributed in large part to the fort’s capable baseball club as they competed for the All-Army Championship two years running. 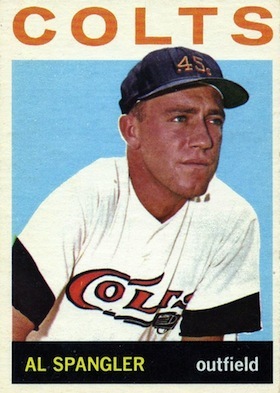 Teamed with a number of budding major league prospects that included future Cincinnati Reds first baseman Gordy Coleman, the Colonels missed championship honors in 1957 when Al’s future Houston Colt .45 teammate Bob Bruce twirled a three-hitter on behalf of Fort Carson, Colorado. When he received his discharge on December 28, the Braves assigned him to the Puerto Rican League to prepare him for the next spring. Championship lineups notwithstanding, the 1958 Braves had a temporary position open while centerfielder Bill Bruton was fully recovered from a knee injury sustained in July 1957. Spangler appeared poised to step into this vacancy, and to further facilitate this, Braves’ batting instructor Paul Waner worked closely with Spangler during the spring. The Hall of Famer declared, “There’s a kid who can go a long way in this game,” but apparently manager Fred Haney had other thoughts. Haney soon returned to the experiment begun the preceding season of moving a reluctant Aaron to center field, and Spangler was assigned to the Wichita, Kansas, Triple-A affiliate in the American Association. The move was predicated on Haney’s desire to put as much pop into his lineup as possible, and Spangler’s Punch-and-Judy style hitting did not fit into this mindset. The vacated right field post was filled by Bob Hazle, a onetime prospect who had batted an astounding .403 with seven home runs over 44 games late in 1957 for the Braves. But 1958 turned out to be a different story, as Hazle hit .143 with no homers through April, was benched and eventually traded the day Bruton returned. At no point during this dismal performance did Milwaukee appear to give consideration to promoting Spangler. Meanwhile Al was posting numbers in Wichita that again demonstrated why he should not be in the minor leagues. Spangler paced the club in both runs scored and hits, while placing himself among the team leaders in nearly every offensive category except the one that seemingly mattered most to the parent club: home runs. As it turned out, both Maye and Spangler were assigned to the Triple-A affiliate newly relocated to Louisville. Generally hitting leadoff, Al would manage a career-high seven home runs, one of which was a memorable ninth-inning game-winning blow June 19 against the Cardinals’ flame-throwing prospect Bob Gibson (of Al’s career 50 home runs -- minors and majors combined -- this would not be the only one of some import). Spangler’s overall output garnered team MVP honors for the Louisville Colonels, and this success transferred to winter play where he placed among the league leaders in the Cuban League (while teamed with perennial All-Star Minnie Minoso). The Braves were compelled to keep Spangler on the roster in 1960; Al was out of minor-league options. An encouraging sign for Spangler was new manager Chuck Dressen’s emphasis on speed, seemingly opening the door for more playing time for the fleet-footed outfielder. Instead he saw limited play over both the 1960 and ’61 campaigns. The reason remained the same: His lack of power was perceived to be a detriment. Al was used largely as a late-inning defensive replacement or in pinch-hitting roles while both former and new faces -- his Jacksonville teammate Wes Covington, Lee Maye, trade-acquired Frank Thomas, and the new flavor-of-the-day, Mack Jones -- helped Aaron patrol the outfield. In Milwaukee’s defense, Spangler represented the same style of play as Bill Bruton, and the lack of power from two outfield posts was likely perceived as a liability Even when Bruton was traded after the 1960 campaign the Braves seemed to go out of their way to find playing time for everyone but Spangler. Left unprotected by the Braves in the 1961 expansion draft after they had actively dangled him on the trade circuit, Spangler was selected in the premium phase and inserted into the Houston Colt .45s’ starting lineup, where he etched his finest years in the big leagues. Author of both the first extra-base hit and RBI in Houston franchise history, Al flirted with a .300 batting average through portions of the team’s inaugural campaign until settling on a respectable .285 mark at season’s end (losing the team’s batting crown on the last day of the season). As Spangler said, “I never played regularly in the majors before, so I didn’t know what my potential was.” As events unfolded, Los Angeles discovered Spangler’s potential when he almost single-handedly beat the Dodgers on September 25, contributing to the late-season swoon that ultimately cost them the NL pennant. In a 3-2 Houston victory, Al scored the first run, tripled to drive in the second, and homered in extra innings to seal the win against Dodgers bullpen ace Ed Roebuck (the first loss Roebuck had sustained in 80 appearances dating back to 1960). The Houston offense scored a major-league low 592 runs in its inaugural season and, incredibly, scored 128 fewer runs in 1963. Spangler was one of the few bright spots in this remarkably dismal lineup, pacing the team in batting average (.281), doubles (25) and runs scored (52), while leading the NL in hitting in August with a .403 mark. After a horrid 0-for-27 performance against the Phillies in Connie Mack Stadium the preceding year, Spangler compensated by feasting on Chicago pitching in 1963, hitting at a .432 clip. He also contributed with the glove, racing to a sinking line drive off the bat of former teammate Wes Covington that ensured the final out in Don Nottebart’s no-hit gem against the Phillies on May 17, 1963. On the strength of two straight solid campaigns, Houston began fielding many an inquiry as to Spangler’s availability. The frequent trading propensity of general manager Paul Richards resulted in Spangler being one of only five Houston players remaining with the club from the original 22 selected in the expansion draft in the spring of 1964. Unfortunately, Spangler’s spring campaign was hobbled immediately when he sustained a fractured wrist in the first game of the exhibition season, and its effects lasted nearly all season. Used sparingly upon his return, Spangler’s batting average hovered around the Mendoza line until a sizzling .325 clip at the end of the campaign resulted in a .245 end-of-season mark. Meanwhile, his penchant for single-handedly handcuffing the Dodgers returned when, on July 21, one of his rare home runs was the difference in a 1-0 pitching gem between Bob Bruce and Don Drysdale. Lest one think Spangler saved his best performances against the Dodgers only, Spangler scored four runs in a game against Bob Gibson on August 19, a longtime Houston record (tied numerous times) until bested by Craig Biggio. The continued confidence shown in Spangler was exhibited by manager Lum Harris when he said, “[Al is] the kind of hitter he was in 1962 and 1963, rather than the .245 hitter he was in 1964. ... [the spring injury] was a handicap both in a late start and in swinging the bat when he first came back.” Both Harris and the soon-to-be-renamed Astros expected great things from their 30-year-old left fielder going into the 1965 campaign. Unfortunately, Spangler came out of the gate slowly, and the resultant series of moves soon saw him playing on the West Coast. With Spangler batting a bleak .213 on May 23, the Astros acquired Al’s former teammate Lee Maye from the Braves, and in the course of the next eight days Spangler would garner a mere four at-bats. On June 1, he was shipped to the California Angels in exchange for left-handed hurler Don Lee. The trade made sense to each team. Both players posted fine seasons in 1962 and 1963, while injuries served to mar each of their 1964 campaigns. When they both opened the new season slowly, it’s not hard to believe that the each team hoped to kick-start their newly acquired player with a change of scenery. The Astros were in need of another southpaw presence on the mound, whereas Spangler’s veteran presence would help usher along the Angels’ young outfield trio of Jose Cardenal, Rick Reichardt and Ed Kirkpatrick. Unfortunately for Al, this also meant a return to the part-time play he knew all too well in Milwaukee. Excluding a sizzling stretch in early August where Al racked up a .444 batting average in seven starting assignments, he was used primarily as a pinch hitter and defensive replacement. The next spring, with yet another young outfield prospect – Jay Johnstone – racing his way through the Angels’ organization, Spangler accepted an assignment to the team’s Triple-A affiliate in Seattle in the Pacific Coast League. As he did in years past, Al showed he had long surpassed the challenges of minor league play. Among the team leaders in nearly every offensive category -- except, of course, home runs -- Al helped lead the club to its first pennant in 11 years. Seattle took on the Tulsa Oilers in the championship series -- but someone must have told Spangler they were facing the Dodgers instead, as he single-handedly dismantled the Oilers with a .440 batting average in the seven-game series, including driving in two runs in a 3-1 victory in the decisive seventh game. Spangler received a late season call-up where his bat continued to sizzle, garnering a .667 average in limited play. This splendid output notwithstanding, Spangler was given his release on February 13, 1967. He was promptly signed by the Chicago Cubs three days later where he was united, albeit briefly, with Curt Simmons, one of the Phillies’ Whiz Kids from Al’s youth. More importantly, he was joining a club directed by future Hall of Famer Leo Durocher, and the strong relationship established between manager and player would last for many years. A .472 average in spring training still resulted in a return to the PCL, but his stay with the Tacoma club would not be long. Spangler set a blistering pace with a .326 batting average that soon resulted in a promotion to the parent club. Before parting the league, Spangler’s bat also prevented the first nine-inning perfect game in PCL history when, on May 7, he stroked a two-out double against his former Seattle teammate Ken Turner, robbing Turner of the pitching gem that was a mere one out away from attainment. The Chicago Cubs had been the NL’s doormat for more than 20 years, but in Durocher’s second year at the helm the team suddenly found itself in pennant contention. A team loaded with four Hall of Fame inductees had few weaknesses, but one was in right field. The position was witness to a veritable turnstile as 11 different players occupied the outfield corner throughout the season, and Spangler’s promotion in June was an attempt to stabilize the situation. Al’s torrid outset contributed to 11 straight starting appearances, but when his batting average began to wane in July, Durocher returned to the platoon option. Spangler still garnered the most at bats with one team since his injury-riddled 1964 campaign. As the curtain came down on the 1967 season, Al appeared poised to compete for outfield playing time in the spring of 1968. Instead, the Cubs made two acquisitions in outfielders Lou Johnson and Jim Hickman, further pushing Spangler down in the depth chart. Although Al eventually carved out a successful role as the team’s pinch hitter extraordinaire, it is worth examining how often his employers would seemingly go out of their way to find options other than Spangler. Beginning with Milwaukee, Al was subjected to a whole cavalcade of preferences -- usually with the desired power that Al lacked -- that included Wes Covington, Bob Hazle, Lee Maye and Mack Jones. After his success in Houston was cut short due to injury, Spangler faced a quartet of young Angels outfielders who garnered playing time at his expense, and now the Cubs were actively trading for other alternatives. Sadly, a career once dubbed as a potential Ashburn clone was instead destined to utility play as a crowd of others constantly received the nod. Relegated to a part-time role, Spangler became a valuable asset, contributing directly to at least four wins (with a particular propensity against future Hall of Famers). For example, when a pitching duel on July 13 against the Mets’ Tom Seaver went into extra frames, Al’s pinch-single in the 11th inning was the difference in a 2-1 victory. Fifteen days later his was the only tally in a 1-0 decision over Don Sutton and the -- who else! -- Dodgers. On August 4, Al came to bat with the Cubs down by one and hoist a ninth inning home run against Bob Gibson that eventually led to a Chicago victory in extra frames. Finally, in Pittsburgh on the next-to-last day of the season, Spangler came to bat in the seventh inning with his team down 1-0 and, with two outs, stroked a two-run pinch-double that paced the Cubs to victory. Spangler credited his manager, Durocher, with a measure of this clutch success stating, “I know when [Durocher] is going to use me [a]nd I can get ready. ... Leo generally uses the same pattern,” allowing Spangler to adjust to this role accordingly. Spangler also spent time doing homework by “read[ing] a lot of stories about Jerry Lynch and Smoky Burgess” and adopting the philosophy of two of the greatest pinch hitters of the past. In the spring of 1969, the Cubs – not for the last time – again fell into the same pattern of looking past Spangler. The Lou Johnson failed experiment resulted in his being traded midway through the 1968 campaign, but now the Cubs had their eyes on two young prospects -- Jimmy McMath and Jim Dunegan -- taken in the 1967 draft. The youngsters were given every opportunity to lay claim to right field, but eventually the post was shared between Spangler and Hickman. Al raced briskly out of the starting gate, and a .351 batting average on May 12 (placing him among the league leaders in hitting) resulted in the lion’s share of starting assignments. Unfortunately a .132 average thereafter -- exacerbated by a right heel injury suffered in early June -- caused Durocher increasingly to turn to Hickman thereafter. This collapse marked the beginning of the end of Al’s major league career. Chicago’s acquisition of yet another right fielder, Johnny Callison, caused the Cubs to add Spangler’s name to the first round of cuts in 1970. Yet due to his close association with Durocher, Al was given the opportunity to return to Tacoma as both a player and coach. Although Spangler garnered 19 more major league at-bats over the course of the 1970-71 campaigns, it was in the role of coach (and later minor league manager) that Al would continue drawing a paycheck in professional baseball. It was not solely his relationship with Durocher (and later Cubs manager Whitey Lockman) that led Spangler to an endeavor in coaching. Over the course of his playing career, Al had been prominently mentioned by Jay Johnstone, Ron Santo and others for providing occasional hitting and fielding tips. His leadership skills were exhibited by the fact that he was frequently the first to run to the defense of his teammates, which sometimes resulted in his being tossed from a game when defending his team. A shrewd student of the sport, these combined attributes made Spangler a sure bet as an instructor. He served as a full-time coach for Chicago in both 1971 and 1974, and managed the Midland Cubs in the Class-AA Texas League in the interim years. It was in the latter capacity that Spangler’s team were forced to suspend an August 6, 1972, game against the Amarillo Giants due to a possible one-time-only instance of grasshopper infestation. Released by the Cubs at the end of the 1974 season, Spangler returned to his home outside of Houston with his wife and their two children. Rebuffed by the Astros in his attempt to latch on with their coaching staff, Spangler dabbled in marketing and business training ventures while still keeping his pulse on the baseball sphere. Eventually he became the coach and athletic director of Hargrave High School in Huffman, Texas, a small community 30 miles northeast of Houston. The school developed an excellent athletic reputation and, through 2012, produced three professional baseball players -- one of whom, Keith Foulke, advanced to the major leagues. In 2009, Foulke would state how “Coach Spangler was vital to my career.” In recognition of his efforts on behalf of the community, the new ball field that Al helped design was named in his honor. Like many players, Spangler did not leave the major-league scene without authorship of some amusement. He once described an event from his early days with the Braves when the left fielder went down with an injury. Unable to recall whether Spangler played left or center field in Louisville prior to his late season call-up, manager Fred Haney asked Al, “Where did you play last year?” Innocently, Spangler replied “Louisville,” at which point Haney promptly tapped Lee Maye to man the left field post. These humorous tales notwithstanding, it was the lack of power that often relegated Spangler to the bench. On countless occasions Al stood by as the power-laden talents of Wes Covington and Lee Maye, Mack Jones and Bob Hazle (among many others) took precedent in the lineup. It is ironic to note that Spangler’s 13 year career eclipsed many of those players who were ushered ahead of him, while also sad to note that Al’s Ashburn-like talents were not both appreciated and utilized in a manner that might have brought untold success to team and player. Even at this writing, a present-day Ashburn-type – Michael Bourn – is realizing considerable success in the big leagues. Would that Spangler might have had that chance as well. The author wishes to thank Al Spangler for ensuring the accuracy of the narrative. Further thanks are extended to BioProject editor Mark Pattison. “Infielders Lead as ‘Hot Prospects,’” The Sporting News, April 18, 1956, 21. “Spangler of Braves Quickly Absorbing Waner’s Plate Tip,” The Sporting News, March 12, 1958, 15. “Value of RBIs ‘Exaggerated,’ Asserts Haney,” The Sporting News, April 1, 1959, 10. “Spangler Bat Adds Cannon to .45 Attack,” The Sporting News, September 1, 1962, 15. The others players being: Turk Farrell, Ken Johnson, Bob Aspromonte and Bob Lillis. “Draftee Brand May Grab No. 1 Astro Mitt Job,” The Sporting News, January 16, 1965, 8. “Spangler Finds His Niche As Cubs’ Pinch-Hit Artist,” The Sporting News, January 11, 1969, 35. “Former Astros OF Spangler gives back to local community,” examiner.com, February 8, 2009. “Colts Like Kasko – He’s a Glove Whiz, Off-Field Comedian,” The Sporting News, September 12, 1964, 18. “No Pension Money for Piccolo’s Family,” The Sporting News, October 10, 1970, 8. “Aaron-Banks-Spangler HR Total Reached 1,030 Mark,” The Sporting News, July 5, 1969, 8.